The fate of the universe lies in the hands of five criminals in Guardians Of The Galaxy. The movie begins on earth in 1988, where a family gathers as a young mother (Laura Haddock) loses a battle to a terminal illness. Shortly after her passing, her young son is taken aborad a spaceship, and grows up to be a low-level criminal known as a Ravager. The man is Peter Quill (Chris Pratt), a half-earthling who doesn't know the identity of his real father. He was raised by Yondu Udonta (Michael Rooker), a blue-skinned Ravager who taught Peter his criminal ways. That knowledge also makes Peter as accomplished a criminal as Yonda. When Peter gets the task of stealing a valuable orb for Yondu, Peter decides to try to pawn it. Korath (Djimon Hounsou), a bounty hunter, tries to kill Peter for the object, but Peter manages an escape. He reaches his destination, only to discover the orb proves to be too hot for even the person who agreed to buy it from him. Peter soon learns how hot an object he has. He may have escaped Korath, but finds more opponents on the hunt for the orb. One is Gamora (Zoe Saldana), who works with Ronan The Accuser (Lee Pace), to steal the orb for Thanos (voiced by Josh Brolin), who wants the object to use against his enemies, the people of the planet Xandar. 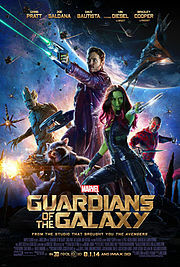 The other is the pair of Rocket (Bradley Cooper), a genetically mutated raccoon, and Groot (Vin Diesel), a tree-like creature who serves as his protection. As the foes battle for the orb, they draw the attention of Nova Corps forces on Xandar, and they arrest all four. They go to a prison known as the Kyln, where imprisoned warrior Drax (Dave Bautista), wants to kill Gamora for her connection to Ronan, whose forces killed Drax's family. Peter, who learns Gamora has a buyer for the orb, convinces Drax to spare her. The five make a daring escape and take their object to a man known as The Collector (Benecio Del Toro). There, they see the value of the orb when an assistant of The Collector grabs the infinity stone, which the prospective buyer opens to inspect the object. Meanwhile, their pursuers follow, and Ronan gets the orb, so Peter contacts Corpsman Dey (John C. Reilly), who arrested him, as they try to keep the orb in safe hands. Guardians Of The Galaxy is one of the more light-hearted entries in the Marvel film franchise, but the film doesn't forget about the nature of action comics. The Guardians have to find a way to stop forces who can cause more damage than they could ever do themselves. They're not the traditional good guys (and in the case of Rocket and Groot, they're not even human), but they do good because the consequences would be far worse. They get to see what an orb with an infinity stone can do, and they're not that sort of bad group. The story, co-written by director James Gunn, effectively uses all sorts of crosses and double crosses. As far as heroes with toughness and attitude go, I prefer Tony Stark/Iron Man, but the Guardians do well when pressed into duty for the universe, even if the universe wonders what the Guardians are doing to deserve that title. Pratt is very good as the goofy, but sometimes smart, Peter, a man who wants to grow up and be known as Star Lord. He loves 1970s and 1980s pop, and holds his mix tapes dear as some of the few things he has left from his mother. He's seen the universe with Yondu and all its advancements, yet he never has become acquainted with the galactic equivalent of an iPod. Peter is a hero in his own mind, yet has an interesting strategy in dealing with Ronan. Saldana and Bautista, the latter of whom came to the big screen from WWE, are good as people who have past issues, but come together to help Peter resolve the issues that follow them because of the orb. Cooper is fun voicing the angry, but technology-efficient, Rocket. Groot, in spite of displaying just a four-word vocabulary, is my second favorite performance from Diesel (next to his performance as a loyal mobster in the great Find Me Guilty). As a plant, Groot has the power of blooming and regenerating, and helps those who help Rocket. The best performance, though, comes from Rooker as the opportunistic Yondu. He pursues Peter for the orb, yet works with the former Ravager when the need arises, especially where the possession of the orb is concerned. Yondu doesn't use guns or ammunition. He leaves the most important work to his trusty arrow, which responds to his whistle. People who cross Yondu usually don't make that mistake again, thanks to his weapon of choice. I also like Reilly and Glenn Close as a corpsman and the Nova Prime leader, respectively, as they reluctantly realize they have to work with criminals. Pace, Hounsou, Del Toro, and Karen Gillan also have effective performances as beings who seek the orb for their own purposes. Stan Lee makes a cameo appearance as a resident of Xandar, as does Seth Green, giving voice to Howard The Duck. Sometimes, heroed emerge from the least likely places and situations. A thief, a trio of bounty hunters, and a vengeful warrior form an unlikely quintet in Guardians Of The Galaxy. Peter Quill and his unexpected allies come together in an effort to keep a planet from being obliterated. That responsibility somehow falls to them, so they act accordingly. The Guardians have seen the power of the orb they had planned to sell, and know that other matters in the universe have more value. On a scale of zero to four stars, I give Guardians Of The Galaxy 3.5 stars. They are the flukes of the universe.